A humorous coaster flying the Irish colours! Both decorative and handy, this coaster will bring a humorous note on your table! 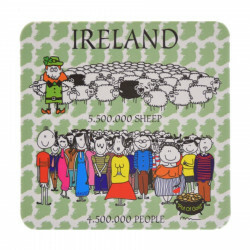 This coaster features the iconic Irish sheep. An Irish blessing is featured on the reverse of this coaster: "Health to the men and may the women live forever". Dimensions: 9.5 x 9.5 cm. Olyart is a young Irish company based in Galway, showcasing the Green Island on various accessories such as mugs, bags and coasters. The two Irish women from Galway who started the Olyart adventure love to share their passion for Ireland. Through modern illustrations, they create unique designs boasting the Irish culture and landscapes. From mugs to bags and coasters, their Irish collection brings a funny, offbeat touch to brighten your day.